If you are looking for a way to create a safe workspace for you and your employees, floor mats can be a great first step to take. 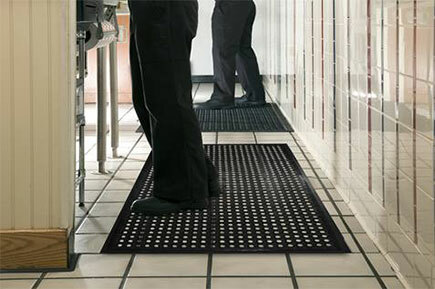 Quality floor mats which are well maintained create a safer environment because they can prevent trips and, in case of spillage or similar incidents, slips. There are also mats which help workers feel less fatigued. So How Do You Pick The Best Mat For Your Workplace? Anti fatigue mats are best for employees who spend most of their working time standing. Those mats work by providing softer ground which is easier on muscles. Anti fatigue matting absorbs the shock due to walking, providing a cushioning effect that reduces foot fatigue. If you are considering putting anti-slip mats in places where they would effectively play the part of anti-fatigue mats, you should know that this is not a good idea, since non slip matting can increase foot fatigue as the mat surface acts to ‘grab’ the shoe soles, causing feet to move forward in the shoe. Alsco not only cares about the quality of its Wet Area Mats and Anti-Fatigue Mats — we also make sure that they are environmentally friendly and made of recyclable materials. If you are still not sure which mats would suit your needs best, just call Alsco and listen to what experts in the field have to tell you.